We made it! It has been some time since I have been to the beautiful Santa Barbara Island, and it did not disappoint. The sea lions were in abundance and as playful as they could be. We departed from Ventura Harbor aboard the famous Peace Dive Boat. The conditions were in our favor as we headed towards the small island. 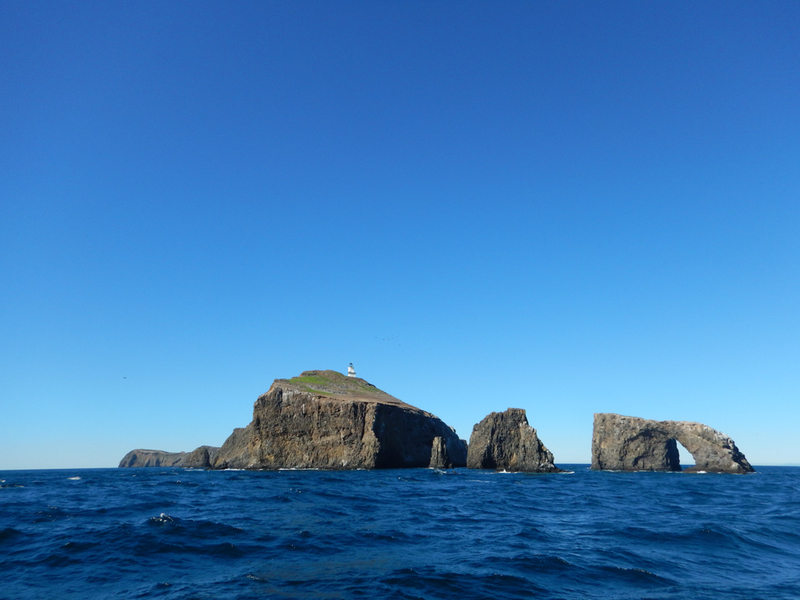 As we arrived at Santa Barbara Island, a beautiful clear sunny sky greeted us. 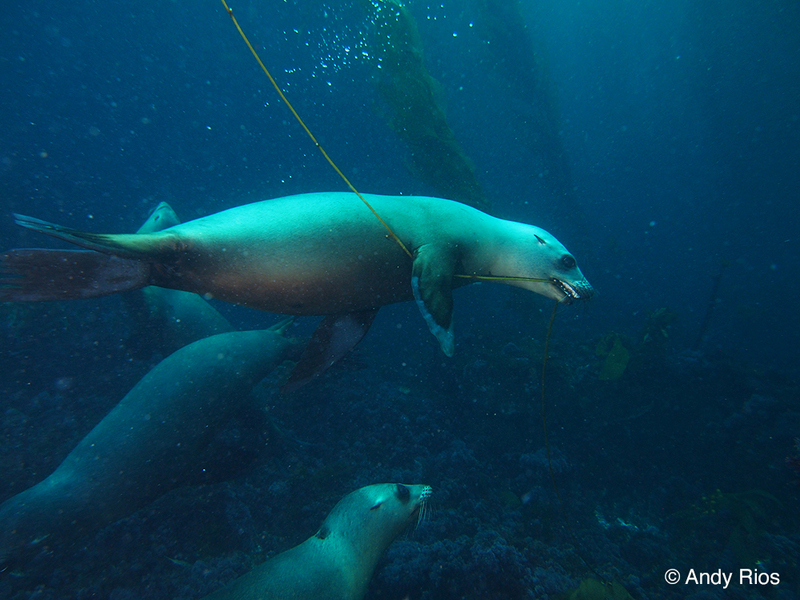 We set anchor at our first dive site, Arch Point, and right away we could see some sea lions swimming gracefully towards our boat waiting for our divers to get in the water. As I descended deeper into the blue water, I came across a beautiful shelf formation where I could find eels, red rock shrimp, scallops, urchins, and more residing along. Further along, I found a shallow ravine where we played in the surge with sheephead and calico bass dancing along. Our second dive was set at Sutil Island, an impressive rock towards the southwest part of the island. The cobble stone bottom was full of life with kelp reaching towards the surface. Along the kelp was blacksmith, halfmoon perch, and opal eyes schooling in a dense aggregation. Toward the end of the dive I spotted a harbor seal darting along. It was a treat to see the elusive creature. The third dive was on the southern end of the island, at a spot called Cat Canyon. Once the boat had slowed down to set the anchor, a group of curious sea lions came to greet us and waited anxiously as we prepared to get in the water. As I descended, I noticed that same group was following along, swimming gracefully around the divers and mimicking our bubbles. The sea lions were doing somersaults, back flips, twirls, and a couple of them nibbled on my camera strobe. A few were playing with a loose kelp frond, passing it along to each other. Once in a while, one would slowly cruise down and rest on the bottom to observe us, as if wondering what kind of strange creature we were, giving a perfect photo opportunity. Further through the site, we found a beautiful wall formation with ledges and shelves along the way where we found giant male sheepheads patrolling their territory. The Peace crew did an awesome job making sure that all the divers were safe, having fun, and most importantly, keeping our bellies full. It was great to catch up with the crew and joke around with them throughout the day. Overall, I couldn't ask for a more perfect day at Santa Barbara Island aboard the Peace. If this sounds like you, we have what you have been looking for. An introductory course where you can learn how to take amazing pictures of your underwater adventures!! Hosted by our resident pro photographer, Mike Brock, this course is designed to help you to better understand your camera’s settings, it’s various menus, and how to best adjust and optimize those settings to vastly improve your results. The course has three parts: classroom session, pool workshop, and openwater workshop. You can sign up for each session individually, or sign up for all three. Check our Dive Courses & Seminars page for details, and call us at 626-287-6283 to sign up. 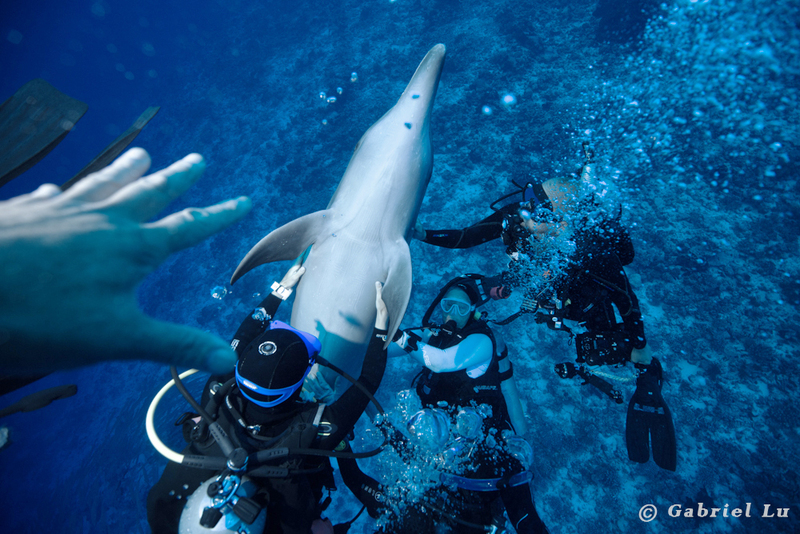 This wild dolphin just loved all the attention he was getting. He stayed around us for over 5 minutes and let us pet him and hug him. He stayed until he needed to go up for air. Most people boarded the night before, and few came in the morning. The boat departed the harbor at 7am and returned before 5pm. It was sunny, but chilly day - water temperature was around 54F. Choice of dive sites was limited due to the recent rainstorm (low visibility from water run-off) and current. Dive #1 at Goldfish Bowl - Marine Protected Area (lobster taking is allowed during lobster season). Double anchored – 15ft at stern anchor, 35-37ft under the boat; sandy bottom under the boat, rocky reef with giant kelp beds starting about halfway between the boat and the island. Visibility was relatively low – about 15ft. There were clearly noticeable amount of sargassum patches, but not quite displacing all the giant kelp. We saw a few lobsters and a variety of fish including sheephead, calico bass, garibaldi, blacksmiths, opal eyes and senoritas. The sheepheads and calico bass were very large. There were many sea cucumbers and sea urchins. Some divers saw abalones and blue banded gobies. A young sea lion was swimming around the anchor area. The photographers were out looking for nudibranchs, but only a few were observed. Double anchored – 20ft at stern anchor, 56ft under the boat; wind blowing east to west, causing some surface current. Similar to first dive site – sandy bottom under the boat, kelp beds starting midway between the boat and island. Slightly better visibility – about 20ft. Sargassum patches were also noticeable at this site. We did not see any nudibranchs, but there were other marine life to observe - abalones, blue banded gobies, kellet’s whelk, Norris topsnail, painted greenling, island kelpfish, garibaldi, etc. The sheepheads and calico bass at this site were also large. Double anchored – 26ft at stern anchor, 56ft under the boat. 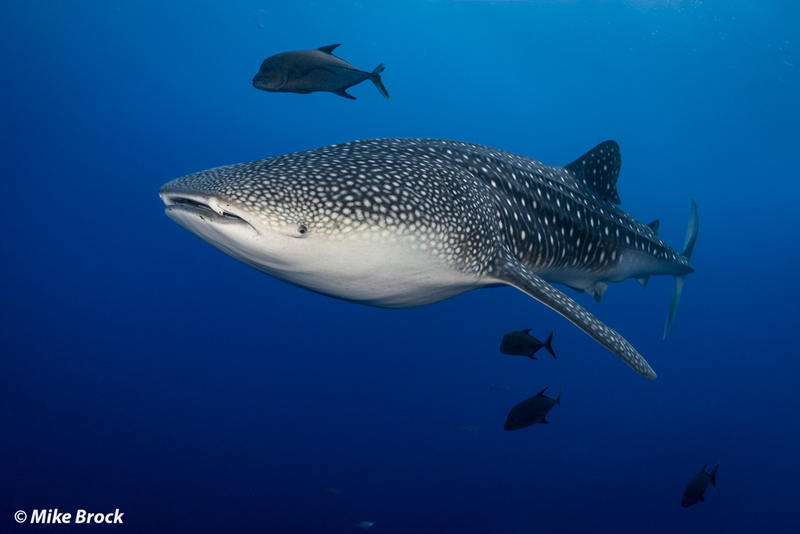 About the same visibility as second dive – about 20ft. A young sea lion seems to have followed us (or it was another sea lion since this one was more playful and swam closer to divers). Finally saw many Spanish shawls at this dive site. Some were mating/laying eggs. What was most noticeable at this site was the especially large size of calico bass, male and female sheepheads, and lobsters. We saw a gigantic lobster surrounded by large lobsters in one hole, and some of the sheepheads were as large as the ones we have seen at Begg Rock. The garibaldi at this site was also very large. Most divers agreed that this was the best dive site of the day. On the way back to the harbor, we were visited by a pod of common dolphins. We could see them swimming toward the boat and they played in the bow wake for a very long time. 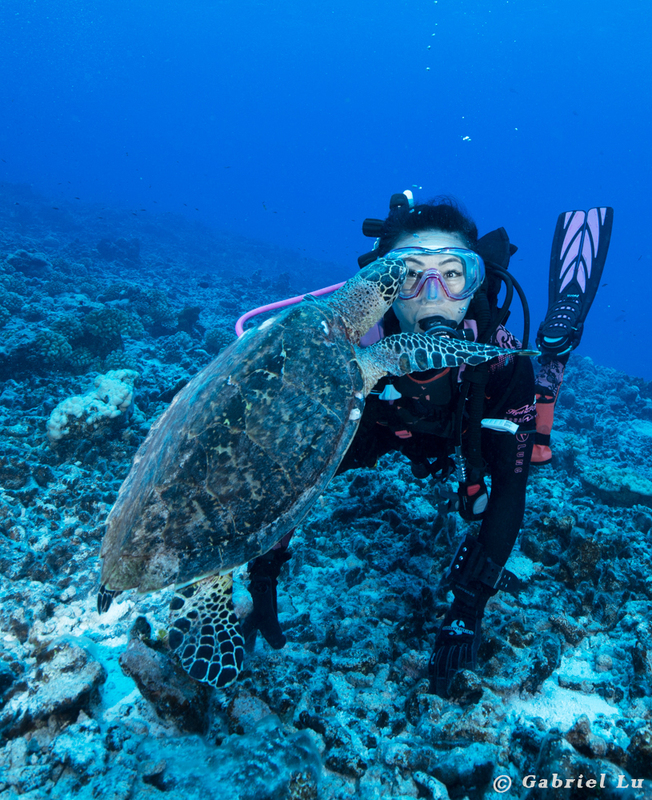 This friendly sea turtle swam over to give a kiss to this beautiful lady.